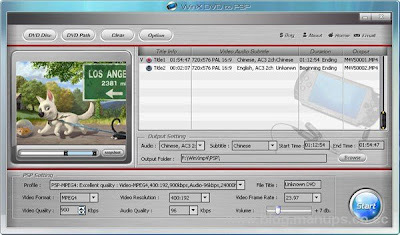 WinX Free DVD to PSP Ripper is a totally free DVD ripper to ripping and converting your DVD to PSP MP4 video, PSP AVC video. Beyond the fun of your game console, you can also enjoy DVD movies by rip DVD movies to your PSP. WinX Free DVD to PSP Ripper is an absolutely free DVD to PSP converter. This free DVD ripper makes it easy to rip DVD to PSP formats. High speed conversion. With this ripping tool, it is easy to convert DVD movies to PSP at high speed without quality loss. Ripping DVD to PSP formats easily with user-friendly interface. It is suitable for computer users with all level of experience. 400x192 AVC, 400x192 MPEG4, 368x208 AVC,368x208 MPEG4, 320x240 AVC, 320x240 MPEG4.